Is human activity influencing climate change or not? Indeed, is global warming even taking place? There is widespread disagreement within academia about the causes of increased global average air temperature, especially since the mid-20th century. Some argue that the observed “trend” is a normal climatic fluctuation. Others claim it isn’t even happening. These issues are the source of rip-roaring arguments in Alberta. Perhaps because of the impact of geological thinking on a province with a petroleum-based economy, the arguments here are both heated and informed. Geologists, who think in terms of Earth’s periods and epochs rather than its decades, are well aware that climate always changes. Perhaps they also have an innate scepticism about whether human behaviour can meaningfully alter the powerful natural forces continually changing our planet. While the debates rage, the scientific “consensus”, as it is delicately called, supports the idea that greenhouse gas emissions from human activity are increasing Earth’s temperatures and thus speeding up climate change. For many environmental groups the problem seems critical, and they call for urgent action. Carbon Capture and Sequestration: So what’s a company to do? Over the last decade, global think tanks have increasingly focused on of CCS – the common abbreviation for carbon dioxide capture and sequestration (more colloquially, “storage”) as a technologically simple way to remove CO2 at some large processing plants. The most prospective targets for this technology include coal-fired electricity generators and oil sands upgraders. Problem is, such ventures are not profit-driven enterprises. They are climate-driven – initiated in response to concerns about climate change and related regulation. On its own, CCS doesn’t make sense. It requires government intervention. In that context, the CCS climate changed profoundly last July when Alberta premier Ed Stelmach announced that his government would provide $2 billion to advance these technologies in the province. That is the biggest sum available for CCS anywhere. Often (unfairly) derided elsewhere in Canada as a Johnny-come-lately to the environmental table, Alberta’s involvement follows a gestation period of deep study. Last January a provincial policy paper observed that “Alberta has a unique opportunity to implement carbon capture and storage to substantially reduce our greenhouse gas emissions. CO2 emissions can be captured where they are produced, transported and stored in geological formations (such as depleted oil and gas reservoirs, coal beds, and deep saline aquifers) that may be located hundreds of kilometres away.... Ultimately, CO2 capture and storage technologies provide the province with the greatest potential to substantially reduce greenhouse gas emissions while, at the same time, retaining our ability to produce and provide energy to the rest of the world.” Alberta is counting on CCS to meet 70% of its long-term GHG reduction targets. When the September deadline for submitting expressions of interest to the Alberta government arrived, the Department of the Environment received “more than a dozen” proposals, according to government representatives. The province is now narrowing those proposals down to the few with the greatest potential to be built quickly and significantly reduce greenhouse gases. The province hopes to reduce emissions by up to five million tonnes annually through this program. The names of the contenders have not been publically disclosed, although the rumour mill is speculating on the usual suspects – big players with interests in oilsands or enhanced oil recovery. Devon, Imperial, Syncrude, a Husky/BP partnership, ConocoPhillips, ARC, Petro-Canada and Total E&P come to mind. One player, however, has been quite public in its enthusiasm for CCS. Shell Canada has long been studying a CCS project connected to its Scotford Upgrader, and a story on that project accompanied a great deal of the coverage of Alberta’s CCS incentives. Sequestration or Storage? The name of that project, Shell Quest, refers to the notion of sequestration. According to Rob Seeley, Shell’s general manager of sustainable development, the idea of sequestration is quite different from storage. “Sequestration implies permanence,” he said. “Storage seems temporary. 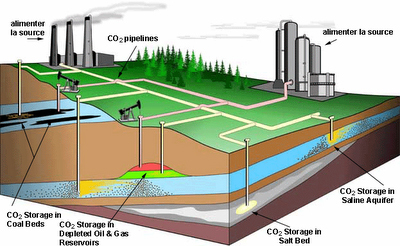 (In a CCS project) the carbon would be sequestered, not stored. It will be there forever.” In his world, CCS refers to carbon capture and sequestration, not storage. The Scotford Upgrader is part of a complex dating back to 1984, when Shell constructed there the first refinery to exclusively process synthetic crude from Alberta’s oil sands. Located northeast of Edmonton, Shell’s Scotford complex has often been expanded. It, and was augmented with an upgrader in 2003. The upgrader receives bitumen from the Albian oil sands plant, and transforms it into two types of synthetic oil – Albian premium synthetic oil and Albian heavy synthetic oil. Synthetic oil is bitumen with the impurities removed and hydrogen added. Adding hydrogen yields upgraded oil that can more readily be refined into high-quality products like gasoline, diesel and other types of fuel. The Scotford plant processes 155,000 barrels per day of raw bitumen. The upgrader is now undergoing a third expansion which, when completed in 2010, will include the commissioning of a third hydrogen plant. Hydrogen plants combine steam and natural gas (methane) to produce hydrogen for upgrading and by-product CO2 that is vented to the air. The key to Shell Quest would be a facility that captured the CO2 from all three of the upgrader’s hydrogen plants. “We will use a patented Shell process that uses amine solvents to scrub H2S and CO2 from our gas stream,” Seeley said. Once the gas stream was cleaned up, compressors would prepare the CO2 for transport to underground storage sites. Compressing CO2 transforms it into a supercritical liquid – a form of matter which has the properties of gas and liquid simultaneously. Once liquefied, Shell would pipe the CO2 to field facilities, where it would be injected into deep, underground rock formations. How it would work: CO2 will remain in supercritical form if stored more than 800 metres below ground. Shell is targeting structures 2,000 or more metres deep. The injection wells would use several casings of steel pipe to ensure the CO2 entered the deep rock formations alone, and would not enter shallower areas of the ground. This would prevent leakage to the surface or into drinking water aquifers. Cap rocks would trap the CO2 underground. In addition, however, three other down-hole traps would keep the CO2 in the reservoir. Liquefied CO2 is a dense liquid (heavier than seawater) under high pressure, and so would stay below the salty water that may exist in the deep aquifer. Another is that in these reservoirs CO2 can combine with water to form hydrates – dense, stable substances at high pressure. Finally, the CO2 may combine with chemicals within the reservoir to form carbonate rock – limestone, for example. These traps plus the cap rock mean there is little likelihood the CO2 would ever leave the injection sites. The Role of Government: Seeley was unwilling to discuss the cost of these ventures, but suggested that Alberta’s $2 billion would be distributed among only five CCS projects, each of which would capture at least one million tonnes per year. The simple math says the projects would each receive a $400 million subsidy. Why should they? In his view, “The beauty of (CCS) is that it can capture very large from industrial sources. However, prices of $80-100 per ton are well beyond the prices that have set for CO2 in the near time. If the price of carbon is $15-20 per ton, it will be cheaper for companies to pay into a government tech fund than to actually sequester CO2.” Thus, if governments see CO2 emissions as a problem, helping fund CCS is a way for them to this important CO2 mitigation opportunity started. The earnestness with which Rob Seeley describes the issue of GHG emissions seems to reflect corporate culture at Royal Dutch Shell. The corporation has identified “six pathways” toward reducing carbon emissions. For the record, here they are: Increase energy efficiency within the corporation. Create technologies that increase efficiency and reduce emissions. Develop low-carbon fuels. Help customers use less energy. Work with governments on effective regulation. Implement carbon capture and sequestration. This seems like a map other oilsands producers should study.